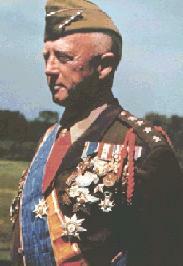 "General George Smith Patton Jr. - Old Blood & Guts"
Fort Riley. In 1916 he went as acting aide to Gen.
promoted temporarily to the rank of Colonel. and three tours with the 3d Cavalry at Fort Myer, Va.
trained at the Desert Training Center, near Indio, Calif.
invasion he was reprimanded by Gen. Dwight D.
Eisenhower for indiscreet political statements. him one of the great combat commanders of World War II.